The underside is marked with a six character Chenghua mark within double blue rings, but it dates to the 18th Century Kangxi period. The foot rim is unglazed. The internal surface is equally well decorated, with further floral sprays, birds and butterflies within iron red borders. Antique Chinese 18th/19th Century Qianlong Mark Bowl Blue Sgraffito Ground. BEAUTIFULLY REVERSE PAINTED WITH A SUPER POWDER BLUE GROUND / FANTASTIC SHAPE. I have more INTERESTING CHINESE ANTIQUES currently listed. BEAUTIFULLY PAINTED WITH A SUPER BLUE SGRAFFITO GROUND / VERY FINE QIANLONG MARK. I have more INTERESTING CHINESE ANTIQUES currently listed. I have more INTERESTING CHINESE ANTIQUES currently listed. There is a old tight hairline and a small flat chip to the rim (see the pics). BEAUTIFULLY PAINTED WITH A SUPER YELLOW GROUND / VERY FINE PORCELAIN. SUPERB QING DYNASTY CHINESE YONGZHENG MARK BUT POSSIBLY LATER BLUE AND WHITE FISH CUP, BEAUTIFULLY DECORATED WITH FISH WIHTIN WEEDS, THE BASE WITH SIX CHARACTER YONGZHENG MARK. GOOD CONDITION. Here we have a beautiful Chinese antique Qianlong period celadon dish. Mark to base. No damage. Significant wear commensurate with age. Low start price measures approx 13cm diameter. Please examine the pictures carefully, as they form the main part of the description. A superb example. Note: I had to end the item and realist, as I noticed that the postage cost was too high. Apologies to the previous bidders, but I want the listing to be fair and I do not make any money on postage. Thank you. This listing is for a beautifully painted Antique Chinese Late 19th C. Yellow Porcelain Planter Auspicious Peaches. It has. Aa few small flake chips to the rim as pictured. There is also some wear to the glaze on the interior of the pot. It measures about 9.25” across and 4.25” tall. Shipped with USPS parcel select or Priority Mail. Probably Qing dynasty / 19th century ?. Chinese porcelain bowl. Red mark under the base partly scratched off, probably in an attempt to remove a label. To Australia : £17. Condition :Scratches under the base (visible photo 12) a minuscule chip on the rim (photo 8 and 9). Chinese Scholar's brush washer bowl, from the late Qing Dynasty. Of globular form covered in a two-tone crackle glaze with ruyi headed band. In excellent condition, as pictured. Apocryphal seal mark of Ming Dynasty Emperor Chenghua. This beautiful antique tea bowl would have been a burial piece dating to the Song Dynasty in China. Having been buried & recovered at some point in it's history it is in truly amazing condition with no restoration at all & no damage or losses, i can only see a couple of very minor surface scratches of little to no importance at all. The glaze is wonderful with superb Hares fur detail inside & out. This bowl is not a reproduction, it is an original Song period piece & as such is a very desirable & collectable bowl. Offered here with a low start & no reserve. Size: 3 1/4 inches (8.9cm) diameter & 2 1/4 inches (5.5cm) high. Weight: 189.9 grams. See all 20 images. This 18th Century Chinese Famille rose tea bowl dates from the Qianlong 1735-1796 period. The porcelain in very fine and thin, one can see through the porcelain when it is held against a light. The decoration is also very fine and has a very rare pattern of a peacock, as well as beautiful fine Famille Rose decoration. Nice tea bowl and two saucers from ca. 1700 Kanhxi period. Sauser is 8 cm wide. Cup is 3, 5 cm high and 5 cm wide. One saucer has a small hairline and a fritting. Two other pieces are in great condition. It’s nice too have the whole set and signed. Unfortunately this is a small hairline crack and just a little flea bite nicks on the cup. It still a nice set. Buyer pays shipping.Shipped with USPS Priority Mail. The base is signed in a diamond lozenge. The decoration is of finely painted peaches near the rim and delicate flowers and leaves near the base. Color / Light blue. We are happy to understand you the matter. We will make every attempt possible to resolve the issue if we made a mistake. We have collected the all kind of Japanese antiques. Also to get proper amount of compensation in case of item breakage. Each consists of three lines, each line either "broken" or "unbroken", respectively representing yin or yang. Due to their tripartite structure, they are often referred to as Eight Trigrams in English. There are dragons on the outside of the bowls as well as a dragon design on the inside. These bowls are in good shape and are signed on the bottom with a Kangxi mark. One bowl has a small fleabite chip on the rim. Age: Daoguang period . Condition: Very good condition. look at the image. -Important Notice-. Here is your chance to own an important empowered item now. We wish you all much good luck in obtaining this sacred one. Super nice! As you view in the images, it was Very nicely finished and complete with many fine details. 4 character blue mark on the bottom. Mid 20th century. 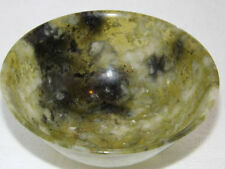 The bowl is in very good condition with very small nicks on bottom rim (see pictures). LARGE Ø22cm! I always try to descibe the condition of the item. I always try to give an honest and complete discription of the item and add a lot of detailed pictures to prevent confusion about the condition of the item. 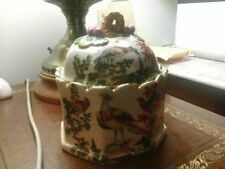 Chinese Famille Rose Porcelain Flowers and Birds Bowl with. QingDynasty Mark. Condition: Good. Famille-verte 'Landscape' bowl, Qing dynasty. the deep rounded sides rising from a straight foot, the centre of the interior painted with a small landscape vignette of a riverside hut under the red foliage of an autumn tree surrounded by verdant hills and blue bluffs . With a articulated dragon and bat on the opposing edges of the bowl. Dragon is missing part of a leg and a couple of fingers. A nice addition to your own collection of Chinese Treasures. SOLD AS IS! Important late 18th century chinese cloisonné bowl with gilding set in French Ormolu mounts made by Ferdinand Barbedienne around 1850. Not marked but easy to recognize as the work of Barbedienne. Inside the dish its decorated with floral patterns. 1,we are Estate sale agent,we help people clean house and sale the stuff from the house. Here we have 2 early 18th century Chinese tea bowls with wonderful bright decoration. F258: Chinese five small plates of colored porcelain with good painting. The painting work, pattern and tone, etc are appropriate Chinese porcelain. MATERIAL : Colored porcelain. REGION OF ORIGIN : China. TYPE : small plate. The sum total of three sides is up to 90 cm. SIZE Width 4.2in : Length 4.2in : Height 0.9in : Weight 12.34oz. 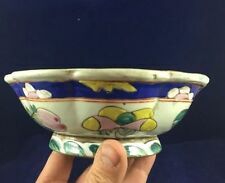 This bowl is not marked, however, I would say that it dates to the 20th century. The condition is excellent. A superb example. SCENIC PAINTED - CANTON HARBOR. BE SURE TO CHECK BACK OFTEN. CHINESE EXPORT PORCELAIN.